Enjoying some family time - everyone on my side of the family, all together for 3 days in Wisconsin. So fun! 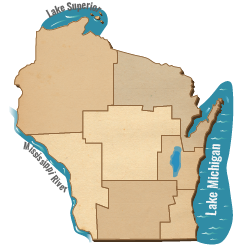 Whether your family likes to camp in a tent or an RV, lakeside or bluff top, remote or right by the action, you'll find a spot to set up camp in Wisconsin. Load up your camping gear and the kiddos and get ready for some fun. Don't forget to pack the marshmallows. Take your family vacation planning to the next level by exploring these great stories. Find the best cabins, waterparks, activities and attractions to keep everyone in the family happy!